Recently, I gave several recipes for autumn vegetables (Sweet Red Peppers stuffed with Fromage Blanc and Herbs; and Baby Bear Pumpkins filled with Ribolita) from the Farmers Market. Here is a delicious dessert to go with them. Actually, the stuffed pumpkin would be a good individual serving for someone who is coming to Thanksgiving who doesn’t eat turkey. These apples are a great dessert for someone who can’t eat flour. Try them any time, they are delicious! 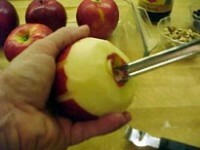 With a vegetable peeler, remove the peel from the top third of the apple. 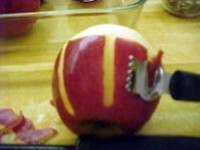 With a zester/stripper, make a decoration down the sides of the remaining skin on the apples. 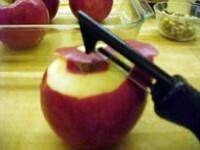 With an apple corer, remove the core of the apple, being careful not to go through the bottom, it should be like a container. 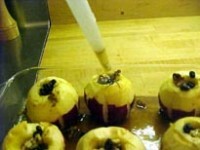 Place the apples in a baking dish. 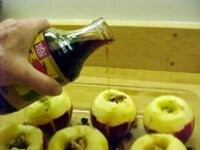 Fill the center of each apple with walnuts, raisins, and maple syrup. Put a generous teaspoon of butter on each apple. Pour a layer of water in the bottom of the baking dish to about 1/2-inch. Bake in a 350 oven for 1-1/2 hours, basting from time to time with the liquid in the bottom of the pan. Add water to the pan to keep it moist. 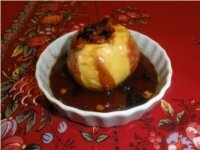 You can serve the baked apples warm from the oven, or cold, or reheated.